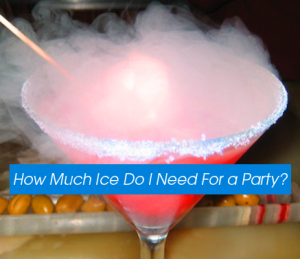 Home › Events › How Much Ice Do I Need for a Party? Are you planning a birthday party? Organizing a special event? Or running a festival? Whether you’re serving cocktails, beer, wine—or just water and pop—you can bet that your party goers will want an ice cold beverage in hand. But how much ice do you need to keep your guests quenched? It can be a bit complicated to calculate. You can use our ice calculator to find out how many pounds of ice you’ll need for your type of party. You’ll also need to figure out if you need ice to keep drinks chilled, to make beverages, or if you need ice for both. Follow our ice estimations below depending on your party plans. You need ice to make drinks. For the parties when you’re serving up ice in cocktails, water glasses, punch bowls, or any other chilled beverage. If you need ice for use in beverages than the general rule is ½ pound of ice per glass. Think about how many guests will attend your party. Let’s say 10 friends show up. If each of your 10 friends has 3 drinks (with ½ lb of ice per glass) then each guest will require 1.5 lbs of ice. In total, you’ll need 15 lbs of ice to keep your guests cool. But let’s say those 10 friends have 10 drinks each. You will need 50lbs of ice! You’ll also have a raging party on your hands, so ice might not be your biggest problem. You need ice to keep drinks cold. If you are keeping drinks “on ice” then you will need about 10-20 lbs of ice for parties of 20 people. Ice bins are a convenient way to store and serve bottled beverages like beer, water, or pop. We generally suggest two 12kg bags of packaged ice for each of the ice bins we rent out. (Our ice bins are 16” deep and 19”diameter). Important host tip: To keep your guests happy, hydrated, and under control, keep an ice-filled tub of water bottles on hand. You will need about 10-20 lbs of ice for parties of 20 people. Ice bins are a convenient way to store and serve bottled beverages like beer, water, or pop. We generally suggest two 12kg bags of packaged ice for each of the ice bins we rent out. (Our ice bins are 16” deep and 19”diameter). Did you know you can place a packaged ice order online with The Iceman? If you need more help estimating the amount of ice you need for your party then contact one of our ice specialists can do the math for you.